One of the ideas I’ve been focused on this year is the rise of “citizen technologists” in marketing — citizen developers, citizen data scientists, citizen integrators, etc. It’s about giving non-technical marketers the tools and empowerment to build apps, analyze data sets, and route data between different cloud services on their own, without having to take a ticket and wait (and wait and wait) for an expert in IT — or even in marketing ops — to do the work for them. I’ve written about this as democratizing martech: distributing power from IT to marketing technologists to everyone. In my previous post, The New Rules of Marketing Technology & Operations, I highlighted these “citizens” as as key example of decentralized technology as a source of agility and innovation. The platforms that empower citizen developers — application-platform-as-a-service (aPaaS) — are a great example of a centralized technology (the platform) that enables decentralized innovation (the apps), balancing the freedom to create with lightweight governance and guardrails. And I don’t mean mobile apps, or at least not just mobile apps. That’s certainly one kind of app that can be built on aPaaS-like platforms. But app building also encompasses business process apps, web apps, chatbot and messenger apps, etc. These are all different cases of the things citizen developers can create. Now, you might be thinking this sounds interesting in theory, but are marketers really going to become app developers en masse? So let me show you this in a way that makes it very real. Let’s plot on a graph the rise of app-like functionality over time in the things that non-technical marketers create. We can start with Excel. Everyone in marketing has used Excel. It was “martech” before there was martech. Marketers used it to model business ideas, optimize budgets, manage lists, track campaigns, etc. And some of marketing’s Excel spreadsheets got pretty darn sophisticated. It’s not unreasonable to claim that some of them were rudimentary business process apps. Excel has been everywhere in marketing. But in more recent years, Excel has been replaced in a lot of marketing departments by Google Sheets. It provided most of the same functionality as Excel, but made it easier for marketers to collaborate on the same sheet at the same time. But Google Sheets also brought new app-like functionality to the picture. Marketers could use Google Forms to collect data on web pages — either inside their organization or externally with customers — and have it automatically added to a Google Sheet. Marketers could then analyze and manipulate that data. Such data input and processing takes us further up the app-like functionality curve. 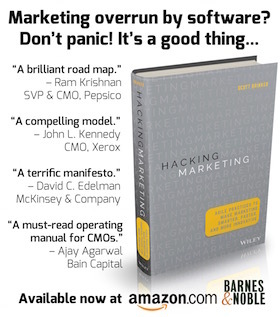 But it doesn’t require marketers to suddenly become software engineers to harness that capability. Next, we can take it a few steps further with a tool like Zapier. Zapier is an iPaaS (integration-platform-as-a-service) solution that’s super easy to use and has become quite popular among marketers. In a simple, visual way, it lets non-technical users route data among hundreds of cloud apps using basic rules. For instance, you can collect data submitted on a form on your website and then route it into your marketing automation platform and your CRM. If the data matches certain criteria — e.g., a highly-scored lead — you can alert business development reps over Slack. You can also easily take data from any Google Sheet and route it into other marketing cloud services — or take data from any marketing cloud service and bring it into a Google Sheet. By combining Google Sheets with Zapier, non-technical marketers can now assemble some pretty advanced workflow “apps” on their own that previously would have required a team of IT experts to engineer. This is definitely much further up the app-like functionality curve. But because it didn’t require any coding, marketers are able to slide up to these new capabilities without having to ever feel like they’re leaping into a fundamental new discipline. And thanks to a new generation of no-code, cloud-based tools that advance the “spreadsheet as an app” concept in exciting new ways — e.g., Airtable, AlphaSheets, Smartsheet — marketers are getting even more app-like functionality at their fingertips. Last month, Salesforce unveiled Lightning Object Creator that lets marketers quickly turn Excel spreadsheets or Google Sheets into apps on Salesforce’s Lightning platform. You’re now pretty far up the app-like functionality curve, just having started with Excel. The next step beyond that will be adopting true aPaaS solutions. Historically, these have been a little more heavyweight, platforms such as Mendix and OutSystems. But a new generation of even easier-to-use tools such as Betty Blocks, Wayscript, and Google App Maker — now part of G-Suite, along with Google Sheets and Google Forms — is making even greater app-building capability more accessible to a wider audience. The rise of marketing technologists was a big revolution in marketing over the past 5 years. The rise of marketers as “citizen technologists” will be an even bigger revolution in the next 5 years. Given the above example — the slide from Excel, to Google Sheets and Forms, to adding Zapier, and beyond — you can see that we’re already well into that revolution. Even if we haven’t fully realized it yet. Another great article. As you know Scott we’re very much believers in the democratisation of technology through low-code solutions. Essentially we are moving towards a data described world with visual UI’s that allow non coders to drive automated code creation. The companies you mention above are doing this in the App space whereas at Cohesion we’ve done the same thing with enterprise website builds. We describe the rendering requirements of a website as JSON which is updated through a visual UI which when required calls our web service which then rights the required code and delivers it back locally (HTML, CSS, TWIG etc). Insightful and timely. Tools like Chatfuel and ManyChat have given rise to hundreds of thousands of Chatbot Developers without the need to know how to code. iPass platforms are helping these new developers turbo-charge their bots and applications. Would love for you to check out Integromat which has become the most-loved integration platform amongst Chatbot developers.